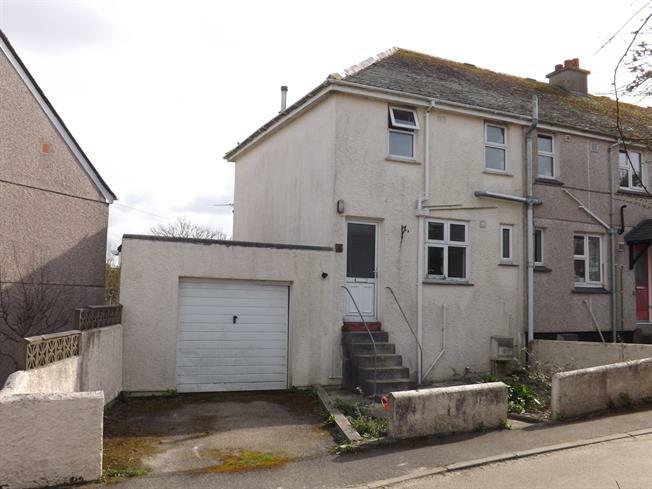 For Sale in St. Ives for Offers in excess of £200,000. This property's price has dropped from £225,000 to Offers in excess of £200,000. You arrive at the property where there is parking and a garage and enter the house through the kitchen, from there you enter a good sized lounge with distant sea views from the bay window. There is a back door and stairs leading to an upstairs bathroom and two bedrooms. Outside is a long garden with access to the rear of the garage. A part glazed door leads into the kitchen with a selection of base units and wall units with fitted electric cooker and extractor over. Stainless steel sink and drainer with mono block mixer tap. A light room with a double glazed picture window that has views to the coast. A feature fire place and surround with a alcove recessed cupboard. Fitted carpets and heating radiator. This room has two double glazed windows to the garden with views. Heating radiator. Double glazed window to front. Heating radiator. Double glazed frosted window to front, with bath ,WC and pedestal sink. With power and light, plumbing for washing machine ,and central heating boiler wall mounted. An up and over door with acces to garden. A long garden with decking area and steps to the garage.